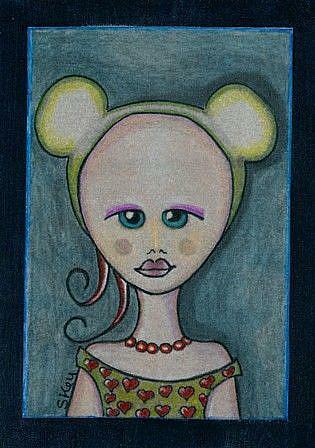 "Vintage Mouse" (gifted) One of my popular series "Mouse Eared Girls." She's wearing Chartreuse colored mouse ears, red Bam-Bam necklace and a Chartreuse green blouse with red hearts. Colored pencil, mixed media on wood. Can stand alone on a shelf or stand, and looks great framed.